Valeant Pharmaceuticals (VRX): Is There Hope for this POS? Take a look at the below chart. It counts to a five wave impulse beautifully. 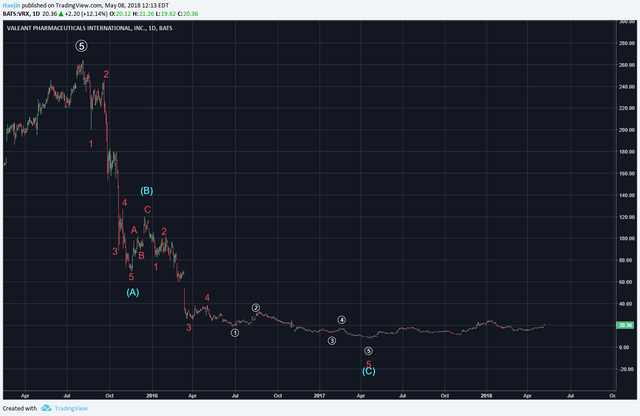 If you saw that wave 5 was potentially in, would you be a seller or a buyer? What happens after a five wave impulse? 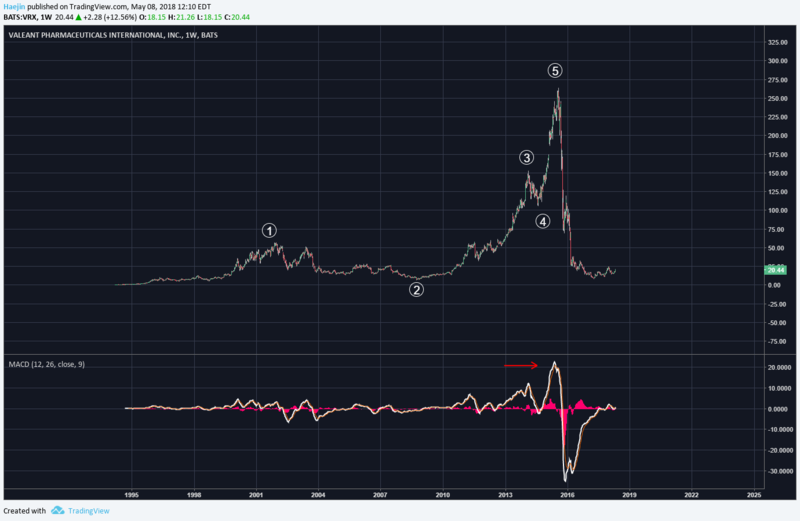 Elliott Waves states that there is a requisite reactionary correction. And look what happened. 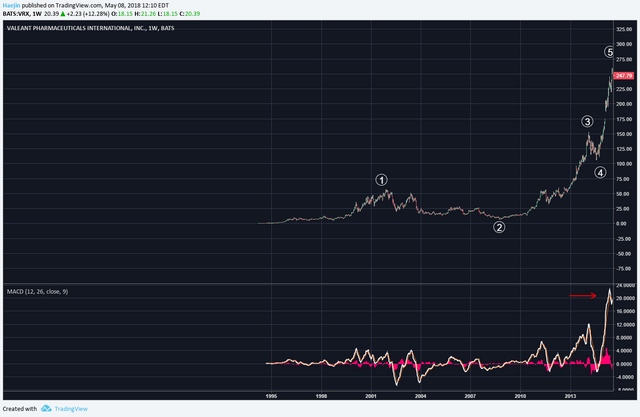 Just the ability to count five waves up would have enabled one to take to the safety of cash by profit selling into the 5th wave. The crash was horrific as it hit 94% retracement!! Is there hope for this POS which has been riddled with scandals? When is the best time to buy? At the terminal end of a correction. Did VRX undergo a crash correction? If you say no, then your dim witts are impermeable to all reason! The correction traced all the requirements of an ABC ZigZag (5,3,5). The subwaves show the qualification of these counts. The blue C wave could be in as shown by the white subwaves of the final red wave 5 of blue C. Hmm, is this the time to be taking buying or selling actions? 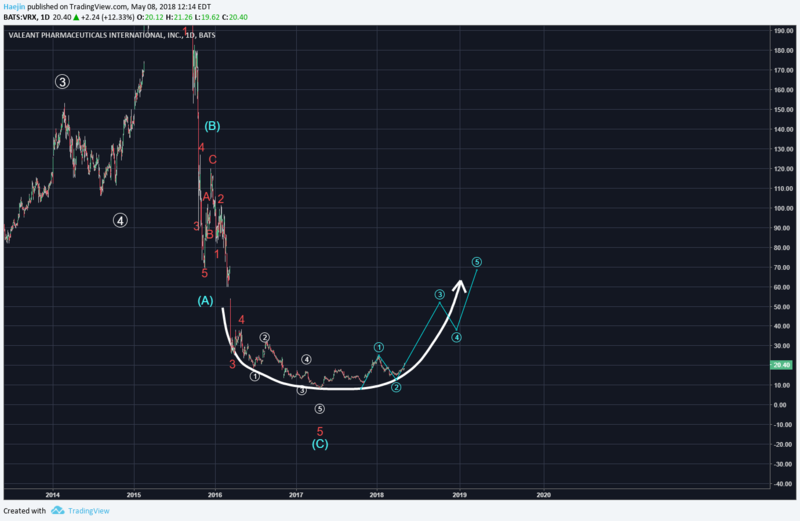 When adding pattern, the rounded price formation is the top candidate and IF VRX starts impulsing upwards; some news or events shall arrive to justify it. However, we would have been aware of it much in advance! Legal Disclaimer: I am not a financial advisor nor is any content in this article presented as financial advice. The information provided in this blog post and any other posts that I make and any accompanying material is for informational purposes only. It should not be considered financial or investment advice of any kind. One should consult with a financial or investment professional to determine what may be best for your individual needs. Plain English: This is only my opinion, make of it what you wish. What does this mean? It means it's not advice nor recommendation to either buy or sell anything! It's only meant for use as informative or entertainment purposes. Essay: Is Technical Analysis a Quantum Event? Follow me on Twitter for Real Time Alerts!! Follow me on StockTwits for UpDates!! Thanks for sharing with us.,.. Valeant??? Is a damn nasty joke? Come on!